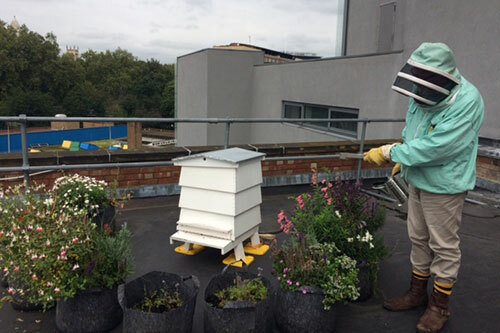 A beehive and wildflower garden have been installed on the roof of the University by City’s Sustainability team. The beehive has been introduced to enhance the biodiversity and habitat of the City campus and to raise awareness of the importance of sustainability among staff, students and the local community. The beehive joins a number of other biodiversity initiatives at the University, including a vegetable garden, green rooves on top of College Building and CitySport and bat and bird boxes. The beehive is managed by professional beekeeper Dr Luke Dixon from Urban & Community Bee Keeping. A member of theBritish Beekeepers Association, he is an expert in rooftop beekeeping and has written several books about bees. From March 2016, Dr Dixon will be joined by a team of amateur beekeepers from across the University who are set to receive coaching on the practicalities of beekeeping and bee-friendly gardening. The City colony is expected to generate around 20kg of honey in its first year that will be used to provide their food throughout the winter months. From next year it is hoped that they will produce enough honey to begin selling it on campus. Bees are an important part of the world’s eco-system and are directly responsible for pollinating at least 30 per cent of the crops eaten in Britain. Without bees, these plants would have to be pollinated by hand, a task that the British Beekeepers Association have said would require a workforce of 30 million. In 2009/10, the Greater London Authority (GLA) estimated that the UK lost a third of its bee colonies. Along with the Mayor of London, the GLA are strong advocates of urban beekeeping, with London’s mild climate and wide range of food providing a welcoming environment for bee colonies. Bees are a vital part of the world’s eco-system and it is widely reported that they are on the decline. As a University in the heart of London, we can help to play a role in the future of an important species and we are delighted to welcome the new colony to City. We look forward to staff and students joining the Bee Team in the spring to learn more about beekeeping, biodiversity and how to create a garden that is optimum for bees. Staff and students who are interested in joining the University Bee Team should email sustainable_city@city.ac.uk or call 020 7040 8053 to register interest and for more information. No experience is required and all are welcomed to apply. The variety within and between plant and animal species in a particular habitat.